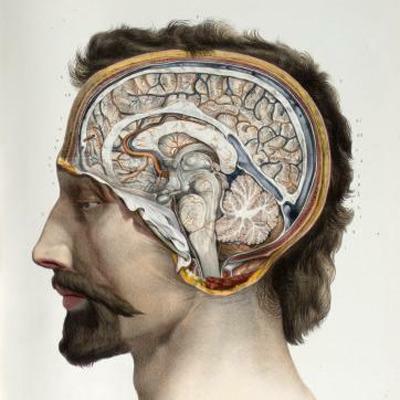 Dissection of the brain, shown in isolation, in 10 numbered illustrations. Brain divided in transverse sections to show cerebral ventricles, superior views. Cerebral hemispheres removed to show the brainstem in situ, brainstems also shown in isolation. Pituitary gland and circle of Willis shown. Inferior views of brain to show cranial nerves.